Excellent park and very pleasant views and location. I record near there and it's a great location for me. It's nice and quiet and safe. The people who operate the park are wonderful, and the sites are pull through. A really great place to stay. Close to a lot of things to do. I stayed here for 8 days over the Memorial Day weekend. At check-in, the staff was friendly and efficient. They said they were expecting me and glad I had arrived safely. My site was #12 located on the Little Pigeon River. The roads are wide and provide sufficient room to back-in or pull through. I had a 29 foot Toy Hauler and was able to back-into site 12 in a matter of a few minutes. The speed limit is 5 mph and is enforced by the staff they actually watch the traffic within the campground... very refreshing. My site had a cement pad and was located conveniently under my awning. The WIFI was free and there is no password it worked but was a little slow. But for being free without a password, it fulfilled my needs. The campground was clean and quite. People used the pool regulary the pool was clean and well-kept. This was a terrific site to spend 8 days to ride the Great Smokey Mountains. 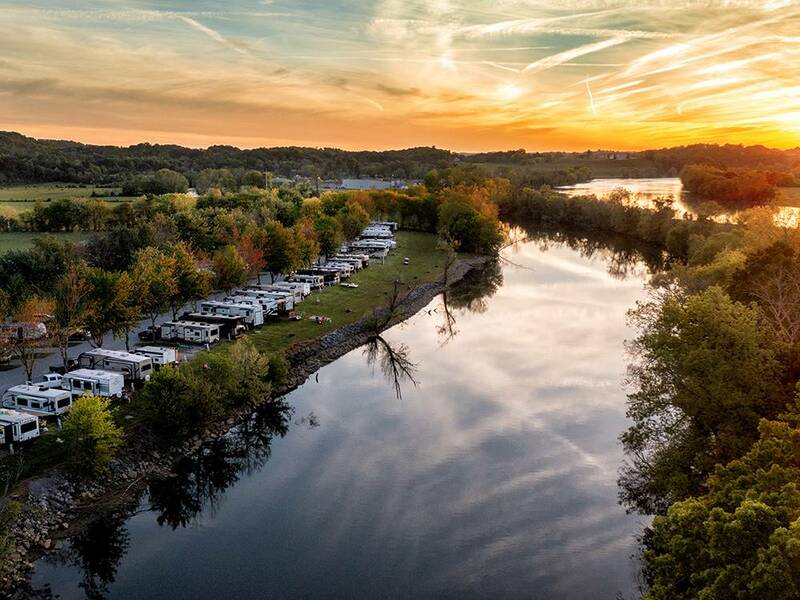 If you are looking for a nice campground in the Pigion Forge and Gattlingburg area, look into Riverside RV Park & Resort. I think you'll like what you see. This is a good place to spend the night. Staff is friendly, nothing special about the park. The sites are very narrow and you are literally on top of the next site, I could not extend my awning without hitting the trailer next to me. Restrooms were adequate. but dated. Appeared to be a lot of permanent residents which is OK, however their belongings spill outside their trailers looking trashy. Good potential if cleaned up. Quick weekend getaway , campground was recommended from a friend . Staff was great , had a pull threw site adequate room for slides and nice site . Overall campground was huge & well maintained. Will definitely be staying here again . 300 plus sites and one shower/restroom facility. The restrooms smelled like raw sewer. Playground is a long way from a lot of campers. Never saw bicycle riding area like web site said. Bikes everywhere no adults watching. Speed limit over 5 mph, joke. Internet never works. The Internet use is first come . Two tower units for again over 300 camp sites. Ad says they do not offer by the month rates,just wait til you get here , almost half the sites are full time sites. No fire ring except at the sites on river. Be sure and bring your entire back yard including your wood stove or fire ring. They will sell you one for 70.00 . Just not good rating for this park second time staying and got worse not better. Oh one last thing need a children's station as choice on available cable. Almost forgot dryer broken no sign on it. Stayed for five nights. Very nice, level sites. People are friendly and helpful to point out areas of interest. We'd stay there again - and will if we are in the area next year in June! Clean Restrooms, level sites and great security. Location is spectacular for views of river; Staff was professional and friendly. Suggested we see Rebecca Ruth's Factory and it was a blast. Played shuffleboard for lst time in 20 years too!! Off the beaten path, but well worth it. Nice pull thru sites and immaculate grounds. Fantastic RV park. Very big pull through sites, quiet with lots of trees. Permanent residents seem to be separated from the travelers. I didn't use the pool, but it looked nice. This was the first time to camp in the area. We picked this campground b/c of the reviews from others. It was a great choice! We had a pull thru site that was very large. The campground was quiet. The restrooms were very clean. (I do have a suggestion for the owners...maybe to put hooks in the shower area to hang clothes.) We would recommend Riverside to others coming to the area. we stayed here 4 nights and found it very nice. Sites were narrow but we did'nt have people on both sides. Wifi was good. Did'nt use the facilities so I don't know about them. We stay here quite often. One bathhouse was completely renovated - very nice. They only have 1 playground (1 swing and 2 slides) and it is NOT safe. The plastic climbing steps up to the slide platform are rotten and crumbling, the deck for accessing the slide is rotten, the landscape timbers around the swing and slides are rotten and there are metal spikes showing. If someone were to fall on one of those metal spikes it could be deadly. We have also seen people walking their dogs in the playground area. PLEASE update your playground! When we turned into the campground we were a bit "taken back" by the cross and " Jesus" in lights above the office.These symbols had no part in the camping experience which was wonderful. The staff was great and made us wish we could have stayed to hear them at Sunday services. Well layout of sites. I had a pull through site which was long and well cared for. Office was extremely helpful and friendly. Rubbish is picked up at your site every morning. Some sites are right on the river. Everything well maintained. the only downer is the Wi-Fi is sketchy at best and loses internet access often. This is a convenient, pleasant, quiet, lovely campground. Our site was along the river. The roads are gravel, well-maintained. The sites are level, and many have trees, providing shade and a nice appearance. The rates are good and the staff is helpful. We have returned twice and recommend it to anyone planning a trip to this area. The campground is very easy to get too, even though the road construction on the main highway you turn off to get to Boyd's Creek. The first night was arrived after 9:00PM, but we called ahead. They placed the site map, number, and car pass was on the door as they said and we checked in the next morning. On check-in they recognize my GS membership and was a quick and smooth process. That night it rained fairly heavy, and light rain the next day, the site was well drained. Site setup was very easy on to setup, it was level, easy connection to sewer, water, elec. and cable. As some reviews on other sites have mentioned, our cable was fuzzy, and wifi signal was extremely weak, but it would not effect a future stay. We stayed in 281 which is a pull-thru, for spring and fall it looks like a great site, but without any shade I don't think I would stay in the pull-thru's during the summer months. 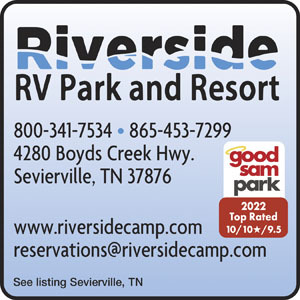 I would recommend this resort to any rv'er traveling to the Gatlinburg/Pigeon Forge area. It's very close to the interstate so gets you out of the traffic in a hurry. But it's still just minutes away from all of the attractions. Level, large pull-thru sites - we are a 37ft Class A towing an 18ft motorcycle trailer. We did not have to unhook from the trailer which is so nice!! Scenic quiet campground. We didn't use the restroom facilities so can't comment. Wonderful park. Clean, quiet, peaceful. Sites are level and have cement pads and picnic tables. We were in site 190 which is at the far end of the campground right on the river and had perfect WIFI signal. Wifi is also plenty fast for whatever you might need it for. The staff is very friendly and the prices are VERY reasonable. If you are looking for a place to stay near Pigeon Forge/Gatlinburg then look no further. It is less than a half hour drive to just about anything you want to do. I cannot recommend this place enough. We will definitely be going back. Very nice campground, lots of trees, area to walk pets. Bathrooms were older and showers were not clean looking--would not use.